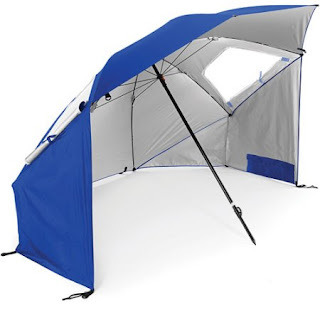 This *BEST PRICE* Super-Brella Maximum Protection Portable Canopy Shelter Umbrella $38.49 (Retail $44.99) will come in handy! The Super-Brella Maximum Protection Portable Canopy Shelter in Blue provides maximum protection from the elements in one large canopy shelter. This is your one stop shop to protect you against a variety of weather conditions. With ground stakes and tethers, this umbrella not only provides against sun and rain, but will withstand against a windy day. It protects from over 99.5% of UVA and UVB rays This large umbrella is ideal to take to the beach, camping, sports games or even for a trip to the park. The large umbrella canopy is wind and water resistant. With the folding action, the setup and breakdown is easy and quick so youre well on your way to getting the shade protection you need. This umbrella also has wind vents in the top and zippered windows to provide airflow while still providing protection against the elements. You never know what weather you may face, so be prepared with the Super-Brella Maximum Protection Portable Canopy Shelter. A carrying bag is also included to easily store and transport this umbrella.